Kyle grew up outside of Asheville, North Carolina. His father was a school superintendent whom also was Kyle’s school principle during his middle and high school days. His mother was a homemaker and substitute teacher whom passed away from a battle with breast cancer in 1999. At the University of North Carolina in Wilmington, Silver graduated at the top of his class. He has since been recognized with their Distinguished Alumni Award. Also, Kyle’s short film The Adventures of Average Joe was recognized with a grant from The Christophers, whose mission is to encourage people of all ages, and from all walks of life, to use their God-given talents to make a positive difference in the world. The Adventures of Average Joe is about “Your Average Joe” whom makes a difference throughout the world with simple environmental and society gestures that we all can do everyday. In addition to the monetary award, Kyle’s film was shown on the nationally-syndicated public affairs television program Christopher Closeup. Kyle worked on the production crews of various movies being filmed in North Carolina, including Last of the Mohicans, Richie Rich and Sleeping With The Enemy. Kyle also was the assistant to the Coen Brothers on The Hudsucker Proxy, which starred Paul Newman, Tim Robbins, and Jennifer Jason Leigh. Additionally, he also worked in casting for the WB television series Dawson’s Creek. During his summers, he was a camp activities director, a position that provided him with some of his fondest memories. Under his leadership, Arch Street has achieved record attendance and drawn top-notch performers to a venue that one wouldn’t expect could attract such luminaries. Greenwich resident Diana Ross, of course, drew raves for her fundraising concert. By luck, pluck, and favors granted, Kyle has also booked the punk band Taking Back Sunday, whose popularity skyrocketed with its appearance on the Spiderman 2 soundtrack, and Jadakiss, among the biggest rappers in the music world. 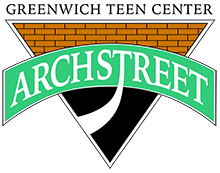 Fabolous, Debbie Gibson, Dispatch, We The Kings, The Click Five, and Paul Shaffer have also performed at Arch Street. Weekend dances and concerts are one of the main reasons Greenwich teens throng to the center. Kyle’s greatest strength, however, is his ability to relate to people. He’s nonjudgmental, advocates second chances and pays attention to what young people have to say. During Kyle’s twenty-year tenure at Arch Street, he has helped many teens work through serious problems and continues to be one of their greatest advocates.